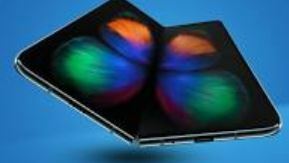 foldable display Archives - Touch Display Research, Inc.
Samsung finally unveiled its foldable smart phone—Galaxy Fold, after teasing about it for several years. The foldable phone is using a flexible and foldable touch screen and cover lens. Touch Display Research believes touch screen is critical to flexible displays, because: 1. Touch screen can provide the interactive function. 2. Touch cover lens can act like the protection layer to the flexible display. Foldable touch screen and foldable cover lens is analyzed in the “Flexible Display & Flexible Touch Technologies, Supply Chain and Market Forecast 2018 Report (3rd Edition)”. This report profiles over 270 companies working on flexible display and flexible touch screens. The 3rd edition Flexible Display &Flexible Touch report has many update over the 2nd edition (which was published in 2015) and over the first edition (which was published in 2013). This report include a PowerPoint file (>600 pages) and an Excel database. Market data in the report includes 6 years history data (2012-2017) and 10 years forecast data (from 2018 to 2027). The market forecast includes a detailed breakdown in 13 application categories: smart watch, wearable (other than smart watch), curved TV, curved monitor/AIO PC, NB/tablet PC, secondary or cover display, mobile phone main display, phablet and tablet, automotive, e-reader and e-note, public signage, gaming casino, other applications. Five size categories are included: <4.99”, 5-9.99”, 10-19.99”, 20-49.99”, >50”. Colegrove, author of this report, has conducted many first-hand interviews of display manufacturers, touch screen suppliers, material and component suppliers, and ODMs/OEMs in recent 12 years. This report provides market analysis and forecast of flexible/curved display, with analysis of flexible touch screen, flexible lighting, and flexible batteries. Touch Display Research offers membership packages for corporations and businesses who would prefer to purchase several of our services at the same time. We offer 3 levels of membership: Gold, Silver and Bronze. Please see the website membership page. This entry was posted in AMOLED, Flexible curved display, Flexible display ecosystem, Flexible display market, Flexible hybrid electronics, Flexible touch screen, foldable display, foldable touch screen and tagged flexible display and flexible touch, flexible touch screen, foldable touch screen, Samsung Galaxy Fold, Touch screen on February 21, 2019 by jennycolegrove. I just returned from CES 2019 at Las Vegas. It’s my honor to meet some of you in person. CES is the conference where many consumer electronic brands show case their most advanced technologies and the conference that set the trends for the near future. At CES 2019, competition between manufacturers of flexible/foldable AMOLED display devices is heating up. At CES 2019, Royole demonstrated the FlexPai. It features a 7.8” foldable AMOLED display with 1920×1440 pixel format, 308 ppi resolution. I had a hand on with the device and bend it. The device can only be bent backwards away from the display. When I tried to bend it inward, the mechanical structure would forbidden it, which can protect their flexible AMOLED. The device is actually light weight. Royole took the 7.8” flexible AMOLED and used it into several other applications: a hat with the display, a T-shirt with the display, and even a purse with the display on it. The battery is hidden in the hat, or the purse. The hat and T-shirt are available for $899 each. The purse is a prototype and they hope a famous brand will adopt the technology. Photo source: Touch Display Research. 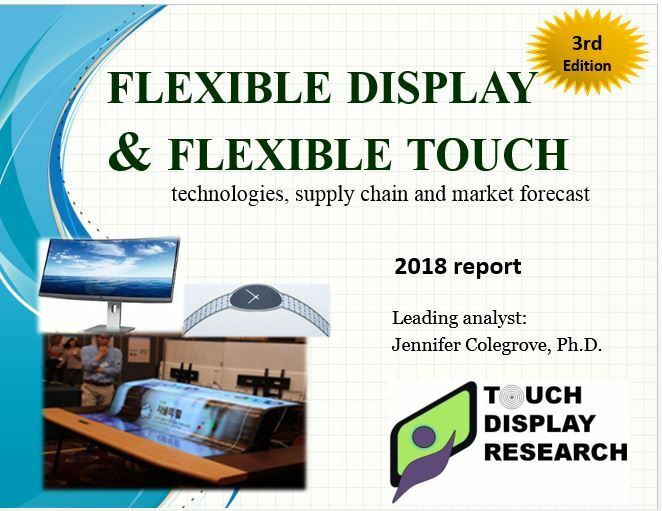 In the Flexible Display and Flexible Touch 2018 Report, 3rd edition, Touch Display Research analyzed over 270 companies working on flexible display and flexible touch screens. Touch Display Research forecasted flexible, curved and foldable display will have over $75 billion revenue, which will be about 36% market share in 2027. What is TCL’s new strategy for 2019? What is Samsung’s new strategy for 2019? Which other startup companies are showing promising new technologies? All these are covered in the recently published Touch and Emerging Display monthly report: CES 2019 special report. This entry was posted in AMOLED, Displays, Flexible curved display, Flexible display ecosystem, Flexible display market, Flexible OLED, Flexible touch screen, foldable display, Touch screens and tagged CES 2019, flexible display, flexible display and flexible touch, flexible display market, flexible display market forecast, Flexible display market report, flexible touch, flodable OLED, foldable display, Royole on January 26, 2019 by jennycolegrove.